← A Santos-Chavez Pipeline: Where’s the demand for Latin America’s oil boom? While these two presidents met in Caracas, U.S. Treasury Secretary Geithner was visiting South Korea, Japan and China, and other U.S. officials were holding discussions with India. The graphic below, shows these states were the top importers of Iranian oil in 2011. The U.S. has begun a methodical diplomatic process, pressing importers of Iranian oil to commit to buying elsewhere, and recruiting Iranian-rival exporters to assist them. The seriousness of this campaign was highlighted on January 14, when China’s Premier Wen Jiabao began an unprecedented five-day series of meetings in Saudi Arabia and other Persian Gulf oil-rich states to discuss their energy relationships, notably skipping Iran. To assess the success of Ahmadinejad’s diplomacy in the allied ALBA states of Venezuela, Nicaragua, Ecuador and Cuba requires a sober assessment of the escalating geopolitical situation that impelled him to take this trip. In this light, the sort of assistance he hoped to receive from President Chavez—his principal ally in the “price hawk” faction of OPEC–becomes clear. But, what assistance was Chavez able to promise him? The answer thus far appears to be: precisely nothing. The key factor here is that, after 12 years in office, Hugo Chavez has not attained the market and technical independence he had intended to attain to be able to defy the United States on a matter so serious as sanctions against his principal ally in the Middle East. From all appearances, he had to send Ahmadinejad home empty-handed to avoid PDVSA and Bolivarian Venezuela themselves becoming the target of a similar campaign. If they succeed, the sanctions being prepared by the U.S., and soon to be matched by the E.U., will present a major challenge for the future of the Iranian leadership. The new sanctions are designed to cut off Iran’s ability to export to the global oil market. This could cause economic ruin for the country. It has already become extremely difficult over the past year for Iran to receive payment for oil it sells due to U.S. and E.U. pressures on foreign banks not to deal with Iranian banks. The difficulty Iran’s customers have had getting payment to Tehran caused some tense situations in 2011 with Chinese, Indian, South African and other buyers. However, the new sanctions will cut much more deeply, intending to actually close down Iran’s ability to export oil and to punish anyone who has dealings with Iran’s central bank, which handles most of its oil payments. To understand Ahmadinejad’s situation more fully, it should be noted that oil-and-financial sanctions are not the only front on which the Iranian leadership is being pressed by the U.S. and its allies. On December 14, a couple weeks before the new sanctions were passed by the U.S. Congress, Secretary of Defense Panetta reversed earlier hedging in the Obama Administration’s policy by pointedly stated that “Iran will not be permitted” to develop a nuclear weapon, and, to this end, “no option is off the table.” [Panetta: Iran will not be allowed nukes, by Scott Pelley; CBS Evening News, December 19, 2011.] This policy has since been reasserted. While their disagreement is fought out over Iran’s nuclear program, more fundamentally Iran and the U.S. are vying for predominant influence in the Persian Gulf. For Iran or any other power to attain that position would be seen by the U.S. as an unacceptable threat to the functioning of the market-centered energy-security system (aka, the “Global Barrel”, namesake of this blog). The withdrawal of U.S. troops from Iraq in late-2011 and the advantageous position this presents to Iran for gaining the upper hand there, and thereby in the larger Gulf area, is the main factor which has prompted the present escalation in the chronic U.S.-Iran conflict. The outcome of matters in Iraq, and, for that matter, in Syria, the main Iranian ally in the Middle East, is very much still up in the air, and will be for some time. [Iran, the U.S. and the Strait of Hormuz Crisis, by George Friedman, Stratfor, January 17, 2012. Nevertheless, for the U.S., the threat of Iran gaining the upper hand in Iraq, of refortifying Assad in power in Syria (and as the dominant force in Lebanon), and also continuing to advance (or to succeed in) their nuclear program, are issues which could decisively tip the scales in favor of Iran’s predominance in the oil-rich Gulf Region, thereby enhancing its influence in the global oil markets generally. The absolute imperative to Washington of avoiding this outcome, virtually guarantees that the U.S. (and E.U.) will not back down in 2012 on their tactic of shutting down Iran’s access to oil markets. The best indication of how threatening the new, hard turn in U.S. policies are perceived to be by the Iranian leadership is the latter’s threat in late December to block all oil shipments through the Straits of Hormuz in retaliation. Tehran understands, of course, that it could not long maintain any such blockade against efforts by the U.S. Navy to reopen the passage. Nevertheless, in my estimation, the Iranian declaration should not be seen as an impotent threat, but, rather as a tactic consisting of demonstrating a credible willingness to disrupt global energy markets beyond a level that the U.S. and other major powers might be prepared to absorb at present, especially in light of their economic problems. This tactic is, of course, a dangerous gamble. Tehran could end up simply handing Washington a legitimization for military action it had been planning, or end up pushing Washington to take military action that it was not actually planning to initiate. In any case, the point here is that this risky gambit goes to illustrate Ahmadinejad and co.’s distress over the new sanctions regime and his frame of mind arriving in Caracas. Returning to Venezuela and President Chavez in all this, it is important to realize that the pressures now being brought to bear on Tehran by the U.S. and E.U. are precisely the sort of campaign that Chavez has so often predicted “El Imperio” intends to eventually bring to bear to end his own government. The Chavista expectation of a U.S. campaign for regime change in Venezuela has been very deeply embedded in the movement’s worldview. Whether one sees the constant harangues by President Chavez warning about U.S. ill intentions against his regime as being historically accurate and credible, or as being outdated and paranoid self-serving propaganda (or as being some combination of these two points of view), nonetheless, the fact is that, within Venezuela over the past 12 years, Hugo Chavez’ fear of U.S. sanctions and intervention has been a key driving factor of Bolivarian domestic oil policy and Bolivarian foreign policy. Chavez has always believed there was a very real likelihood that the U.S. would eventually “come for our oil, like they did in Iraq” by plotting with what he constantly said were opposition “golpistas”(coup-plotters). It was precisely from this mindset that Chavez put so much emphasis on south-south partnerships, on Latin American regional integration, and on trade relationships that avoided use of the dollar (recall his international-barter schemes), and generally on avoiding any participation in “the global markets of El Imperio” or “globalization”. A central goal of his oil policy has always been to diversify exports away from the U.S. and the global marketplace (e.g., by focusing on bi-lateral deals with China) to enhance Venezuela’s “oil sovereignty”, insulating his government from U.S. political and/or economic pressures. 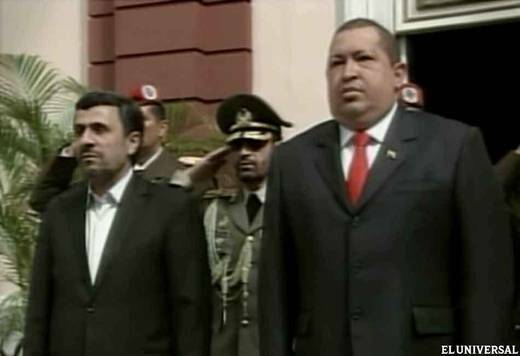 Is Chavez Impotent To Help Ahmadinejad? In light of this, it was undoubtedly a matter of great dismay to Hugo Chavez that, when Ahmadinejad came to Caracas, he was impotent to promise any material assistance to his close ally from Tehran. When one considers the propensity for President Chavez to sign MOU’s (memorandum of understandings) and other economic-cooperation agreements with foreign visitors in Caracas and on his trips abroad, it is especially notable that there was absolutely nothing written in the media or said by either president (to the best of my knowledge) indicating that Chavez had promised to extend any material aid whatsoever to the Iranian leadership. In particular, he did not promise to pick up Iranian oil in violation of sanctions, or to refine and market it through PDVSA, or to send any refined products into Iran. Nothing whatsoever. Put otherwise, President Chavez had nothing to show for all his talk, plans and efforts over the past decade in preparation for precisely such a confrontation with El Imperio. Instead, Venezuela remains abjectly dependent on oil exports via the intermediary of “the global markets of El Imperio” and traded in dollars. More particularly, in spite of significant increases in exports to China, the largest portion of Venezuelan exports still go directly to the U.S. itself (43% in 2010, and about six times as much oil goes to the U.S. now as to China). The only hope Chavismo has had of escaping this dependence was to dramatically increase its sales to China. Why China? Not merely because China needs a lot of oil. Other markets need a lot of oil as well, especially in Asia. Rather, the key factor is because China is the only country in the world which has a geostrategic aim of importing oil via bilateral arrangements so as to insulate it from dependence on the global oil market (The Global Barrel). This aim happens to coincide with the aims of Chavismo to escape “the markets of El Imperio” and “globalism.” However, Chinese reasons are a bit different. China is the only major state today which aspires to project power, especially naval power, independent of and against the U.S. Navy. China has a very long way to go towards this goal, and, indeed, it may give it up at some point. However, to accomplish this end, China cannot willy-nilly rely on imports from the global oil market for its domestic and military transport fuels—wherein the U.S. can do things such as impose sanctions, bring its Navy to bear, and etc.–as it is now doing against Iran. If it is to project power independent of the U.S., China must instead try to develop bi-lateral deals to bring oil directly to the Chinese mainland avoiding the U.S.-dominated global market. This policy has not gone so well to date (viz. The Chinese premier is visiting U.S.-ally Saudi Arabia looking for alternative import sources because its access to Iranian oil might soon be cutoff by the U.S. hyperpower). However, from the other side of the China-Venezuela relationship (as I explained in some detail in my post of 17 December, 2011), for Hugo Chavez there are major infrastructural and technical barriers which stubbornly continue to prevent him from greatly increasing the percentage of Venezuelan oil PDVSA can export to China. This means it will not be possible for Chavez to significantly reduce the high degree of Venezuelan dependence on the U.S. market, not for many more years. Has had a decade to change this dependence on the U.S. Having thus far failed, he has not gained the ability to act independently of the geopolitical will of the U.S. And, for this reason there is virtually nothing of significance that Hugo Chavez can do now to assist his ally from Tehran to face the coming avalanche of ruinous oil and financial sanctions. Any help Chavez may give to Iran to avoid the new sanctions would certainly bring a new round of penalties and sanctions from the US on PDVSA and perhaps on Venezuela itself. And they would be significantly more severe than last year’s, as the penalties spelled out in the law escalate for repeat violations. Last May, Washington made it clear to PDVSA and Chavez’ government that it had selected the minimum penalties permitted under the law. Washington also made it clear to PDVSA that the U.S. had never been engaged in activity to undermine PDVSA or Venezuela in oil markets or otherwise. Further, if they had been, the results would have been ruinous for Venezuela, given its continuing dependence on U.S. oil sales and on increasing participation in the U.S. bond markets, and etc. This simple message apparently made a significant impression in some Bolivarian government circles. I was also told of this communication in some detail by Chavista functionaries who had been internally informed of it, and were clearly impressed by the logic of Washington’s. argument. Another factor as to the likelihood of sanctions being imposed on Venezuela for aiding Iran, is that the Republicans, from Connie Mack in the House to the presidential candidates, have been recently claiming that Hezbollah and Iranian Revolutionary Guards have big connections with Venezuela and throughout Latin America. These claims are generally without substance; nevertheless, these Republican accusations mean that Obama would be subject to partisan criticism in a U.S. campaign year if he did not act against Venezuela should Chavez again violate Iran sanctions, even at a minor level. So, Venezuela will be under a Washington microscope on this issue. It is my feeling that Chavez et al are not willing to risk another violation of US sanctions on Iran. And, China would also not be of any great help in this regard. Not only is there no infrastructure in place to rapidly increase PDVSA exports to China to compensate for any loss of access to the U.S. market, but, in my estimation, it is extremely likely that China will end up acquiescing to U.S. demands to cut its imports of Iranian oil. This is based on my understanding of how and why China acquiesced to the last round of Obama administration sanctions on Iran, after initially loudly objecting. (See my Op-Ed in Middle East Economic Survey: “China’s Angst over Iran Sanctions,” June 2010.). Of course, one must consider that Hugo Chavez strongly supports Bashar Al-Assad of Syria just as he supported Gaddafi till the end. Chavez is quite upset that these authoritarian leaders whom he has seen as two of his few remaining kindred spirits against the “colonial powers” [“Chavez and Putin agree to defend independence and sovereignty of Syria and Iran” Phone conversation, Mercopress, 18 Jan. 2011] are being pummeled by popular revolts in close alliance with US-EU pressure. Now that Iran and Syria are in real trouble there is always the possibility that he might be moved to make some gestures in material support for Iran. But, any new US sanctions against Venezuela for aiding Iran could very quickly bring things to a real train wreck for Chavismo. In short, in calculating what Chavez is able to do to aid Ahmadinejad and the Iranian mullahs, counting how many tankers PDVSA has available, and assessing whatever spare refinery capacity it might have to dedicate to the task of helping Iran get its oil to market–is rather irrelevant. The fact is, PDVSA and Bolivarian Venezuela are abjectly dependent on oil exports to the U.S. market and on access to the U.S. bond market and financial institutions. Unless Chavismo is in a self-destructive mood, Hugo Chavez will have to suffer sitting by and watching his Iranian allies struggle on their own to withstand the new U.S.-E.U. sanctions regime. This entry was posted in Chavez, China, Euroepen Union, Gaddafi, Hugo Chávez, international relations, Libya, OPEC, PDVSA, The USA, U.S. oil, Uncategorized, Venezuela diplomacy and tagged Chavez, Iran, Mahmoud Ahmadinejad, Middle East, Nuclear program of Iran, Persian Gulf, United States, Venezuela. Bookmark the permalink.